Ah, Seinfeld. Come back already, will ya? I’ve always loved this line by Seinfeld. It’s a funny premise and likely not actually true – I think if given the choice, most people would speak in front of a group vs. stand in front of a firing squad – but regardless, most people are extremely afraid of public speaking. And that’s ok and understandable. But its a skill set that is extremely valuable and one that I think everyone should strive to obtain. It wasn’t until later in my career (I suppose I can call my late 20’s “later in my career” at this point) that I began to understand that it would be important for me to be good at public speaking. I was leading a growing company and found myself more and more giving presentations to them and hosting townhalls. I was in more pitches for new business to bigger and bigger brands (like this one where the client said, “we’d like to work with you when you’re a little bit older”). As a company we were also focusing more on thought leadership and speaking at industry events comes with the territory. So I found myself needing to get out more and speak. Over the past five years I’ve spoken at over 30 events. Sometimes I’d have a crowd of 15 people in the audience. The largest group I’ve been in front of to date was 1,200 (it was a panel of social media gurus – yikes). The largest keynote (where its just you kicking off a conference) I’ve given was to around 500 people. I’ve run the gamut of speaking and I believe its helped me to grow in business and in life. Why should you become good at public speaking? In some way or another, it will help your career. Most people who progress in their career will find themselves having to give talks or presentations. The better you do at those, the higher you’ll go. Becoming good at public speaking will give you confidence in many other areas as well. Knowing you have that skill set, which most people are deathly afraid of doing, is a pretty good confidence builder. It will make you smarter. That’s right, when you have to give a talk, you have to really dive into a subject and pull out what you think is interesting and special. We’re all moving so fast these days that its hard to find time to sit and think deeply about a subject. Public speaking forces you to do this. This year I focused much more on the internal success of Engauge and did not speak much. Next year I’m going to dial the speaking back up because I’m pushing myself less from an innovation standpoint than I want to. Basically, I’m not exercising that part of my brain as much as I need to. Start paying attention when watching other people give talks. Make notes on the things you like and the things you don’t. Give a short talk (15 minutes is fine) to your team at work on something new or a project recently completed. Similar to giving a toast, start asking questions at other people’s presentations. Standing up and asking a question in front of a large group of people is a good way to get your nerves up. You could read some books on public speaking or attend some courses, though for me its always best to have a “jump in and start” mentality. Just do it, right? Once you do some of these things and start getting confidence, you might be ready to pick a conference where a) you know that you’re an expert in the topic and b) they’ll have smaller breakout sessions (i.e. not massive crowds). You can ask to be on a panel, which is a great starting point as you’ll only be expected to say a few things and you’re in front of the crowd, getting some great experience. Pretty soon, if you’re like me, you’ll be making a list of goals for 2012 and learning to speak in front of groups, or getting better at it, should be on your list. 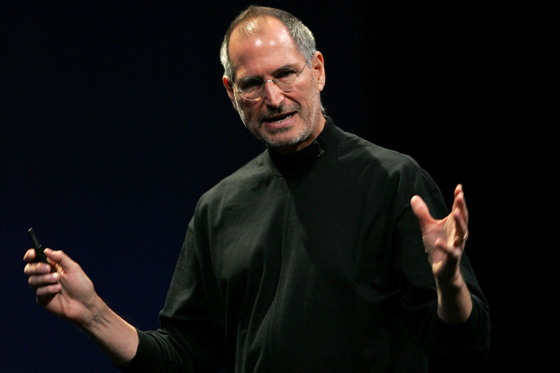 Jobs is largely credited as one of the best presenters ever. He rehearsed intensely.